We can develop sophisticated and affordable Database applications for your company: from simple customer/data tracking to the merging of multiple external sources of information, from dynamic update queries to linking of local resources to the World Wide Web. You can access your data securely and timely from anywhere in the world even if your resources are centrally located. We employ secure transactions to make sure that no one has unauthorized access to your data. We handle both 2-tier and n-tier applications, legacy application conversion, and database conversion. We have experience in creating wide-range applications using different scale databases, from small and fast to huge databases with complex distributed structure. 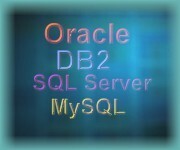 We have a team with strong database management background and experience. RCSI provides database architecture, development and tuning services. Our skills allow us to build reliable and optimized data repository and management mechanisms, which result in functional information management systems for our clients. We can create data warehouse environments, which allow data to relate and integrate regardless of source, location, format, or communication requirements. The final result of our efforts is the transformation of data into meaningful business information. We create browser-based, portal technology capabilities for our clients with an integrated view of data from different functional areas. The user has the capabily to access detail data and provide data summarization within an organization hierarchy, perform data decomposition by categories, and transform textual and numeric data into graphs and charts through data visualization. We can help you build an efficient information delivery and business transaction infrastructure.